Paul Sérusier studied at the Lycée Condorcet in Paris, where he showed an early interest in philosophy. In 1885 he entered the Académie Julian. Two years later he travelled for the first time to Brittany, where he painted his first naturalist works, using a palette of dark shades; one of them earned him a distinction at the 1888 Salon. That same year, Sérusier visited Concarneau and Pont-Aven. 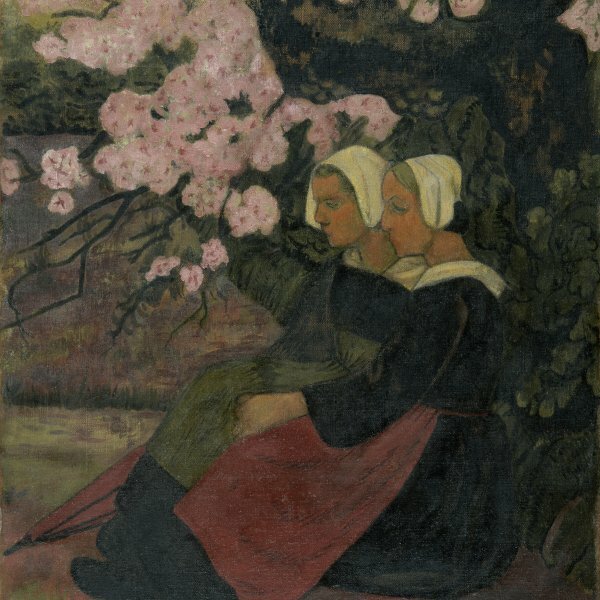 In Pont Aven, at the end of the summer, he met and befriended Émile Bernard and Paul Gauguin who, only the previous month, had laid the foundations for Synthetism with works like Breton Women at the Pardon and Vision after the Sermon, respectively. At the beginning of October, guided by Gauguin, Sérusier painted Bois d'Amour in Pont-Aven, an innovative work in its use of flat surfaces in arbitrary colours. Back in Paris, Sérusier showed Bois d'Amour in Pont-Aven-also known as The Talisman due to its referential character-to his fellow students at the Académie Julian, Maurice Denis, Pierre Bonnard, Paul Ranson and Henri Gabriel Ibels. Thus, he proposed to them the creation of the artistic fellowship of the Nabis-a term which in Hebrew means "prophet"-in which he played an important role, as an artist and as a theoretician. In the summers of 1889 and 1890, Sérusier returned to Brittany to work with Gauguin. There, he was deeply moved by the simple and pious life of its inhabitants. After Gauguin's departure for Tahiti, Sérusier established his atelier in the towns of Huelgoat (1891) and Châteauneuf-du-Faou (1893), where he painted Breton women, usually busy with their everyday chores, allowing himself to be guided by the example of his master and by his interest in Japanese prints. His trips to Paris were reduced to short sojourns during the winters, in order to exhibit with his fellow Nabi artists. In 1898, thanks to the painter Jan Verkade, who was close to the Nabi group, Sérusier visited the monastery of Beuron (Germany), where he was taught by the artist and Benedictine monk Desiderius Lenz. From then on, he developed a complex theory on the use of colour consisting in the separation of warm and cold colours, in order to avoid chromatic dissonance. At the same time, Gauguin's influence began to give way to a more hieratic and allegorical painting, inspired by medieval tapestries. In 1908, Sérusier began to teach painting at the Académie Ranson in Paris. His experience as a teacher led him years later to publish his guidebook ABC de la peinture (1921). Sérusier died in Morlaix, Brittany, on 6 October 1927.